The Friendly Society of Odd Fellows was established in Manchester in the early 19th century. An early type of voluntary co-operative, it was open to healthy working men under the age of 40. 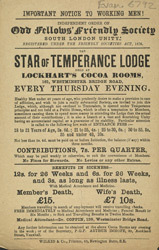 This leaflet advertises some of the benefits provided to the society's members, in particular its policy of providing financial and social support for members and their families in case of sickness, infirmity or death. This was guaranteed to members who paid seven shillings to the society per quarter. This particular branch calls itself the Star of Temperance Lodge, but while the Odd Fellows were established under the principles of other Temperance lodges of the time, members did not have to be teetotallers to join. The Odd Fellows survive to the present day, with this branch's headquarters now on Queen's Road in Peckham.